UMW Toyota Motor (UMWT) has released a teaser video for the new Toyota Vios on its Facebook page. The clip, pasted above, shows the style aspects of the new Vios, zooming on the exterior and interior of the next-generation B-segment sedan. 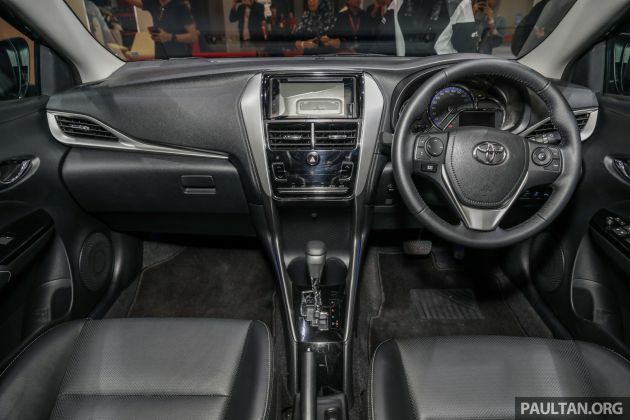 It’s the Vios “as never before,” boasting “a new sense of style, superior driving comfort and improved cabin quietness,” the video touts. The top-spec Vios 1.5G is seen here in the new Dark Blue Metallic, and with an optional aerokit. The latter is distinguishable by red accent stripes on the lower portion of the front, rear and sides. The new Vios was displayed at the just-concluded 2018 KL International Motor Show (KLIMS), where order books were opened. Power comes from a carryover 2NR-FE 1.5 litre engine, making 107 PS at 6,000 rpm and 140 Nm of torque at 4,200 rpm. This Dual VVT-i unit – paired to a CVT with seven virtual ratios – was introduced on the Vios in 2016. As usual, there are three variants – J, E and G. Standard kit includes reflector halogen headlights with a follow-me-home function, 15-inch alloy wheels, keyless entry, push-button start, fabric seats, a drive mode switch with Eco and Sport modes, automatic air-conditioning, illuminated door sill scuff plates, front footwell illumination, rear parking sensors and a CD/radio head unit with Bluetooth and four speakers. The mid-spec E adds LED tail lights, fog lights, auto-fold door mirror with indicators, an acoustic glass windscreen, 60:40 split-folding rear seats with a centre armrest, a multifunction steering wheel and a DVD-AVX infotainment system with a 360-degree camera system and a front digital video recorder a.k.a. dashcam. Opting for the top-spec G gives you projector headlights, 16-inch alloys, premium solar and security tint, leather on the seats, steering wheel, gearknob and front armrest, paddle shifters, an Optitron instrument cluster with a 4.2-inch multi-info display, six speakers, front parking sensors. Safety-wise, all models get seven airbags, ABS with EBD and brake assist, stability control and rear Isofix child seat anchors, with the E and G variants also getting a blind spot monitor and rear cross traffic alert. Besides the hero colour seen here, the new Vios can be had in Red Metallic, Attitude Black, Silver Metallic and Super White II. Now open for booking, estimated pricing for the new Vios is RM77,200 for the base 1.5J, RM81,200 for the 1.5E and RM87,300 for the 1.5G. Options include a RM2,160 DVD-AVX system for the J variant, a RM350 rear digital video recorder, RM2,120 premium solar and security tint (for the J and E) and the RM2,800 aerokit. Do wait for P2 Bezza facelift coming soon. looks much sportier better than this bius. Every Vios launch basher will condemn the car. But end of the day, sales figures show Vios is still best seller for Toyota. So basher can bash all they want but at least UMW does not lose a single sen as opposed to losing RM4 mil per day the past 20 years. Or those early afterlifed by xploding airbags, or kirred due to soft compromised sheet metal body. Adding these 3 things, the price is cheaper. Is it fixed with inferior goods? Or Toyota deceives buyers who don’t know that these safety features are so important? Better sales does not equal better car. Tease here, tease there. Playing hide and seek when its alredi available everywhere else in ASEAN. Toyota lords still thinking pipu r hardup to buy their outdated, unsafe junks. Same like Proton X70. One whole year tease and syiok sendiri. Look into the mirror before commenting on other cars. Toyota P2 Fanboi detected. Same review as related to other articles. Since when is X70 available anywhere else in ASEAN? Lol Proton basher kena kantoi lagi. Before they start make money with X70, the car also outdated already ler. On second thought, will the car sell with Proton badge is also a big question. Hahaha! Toyota failed marketing, that’s why. Their cars are so hideous they need to hide it from the public. Still loses to the Honda City in terms of design and practicality. Both are differnce.. especilly in malaysia.. where price gap is almost 20k.. and one is compact while others is sedan.. mlaysian even buying axia 20k using loan.. u expect to say 20k differences is small aa ? No LED headlights?, even the cheapest Myvi has it. And what’s with that afterthought dashboard? the center console and touchscreen unit looks so aftermarket. remove that annoying rear fog lamp!!! Cannot. That’s government MoT requirement under Ece95 requirement. I bought a vios just so I can shine the rear fog light in those vios driver’s face. Malaysian will go for H badge intead UMW. Only trusted cars with no problem getting spare parts fast anywhere are Toyota and Honda (and Proton). For Toyota Vehicles, do they fit with ADAS system?